Charlotte's Web, Babe, The Hogfather, Spirited Away, Porco Rosso. The world is always changing, without pause or hesitation, but we would be foolish to assume that we have transformed just because reality has changed - especially if we judge it as “bad” or “good”. As anyone who is familiar with Traditional Chinese Medicine knows, in Chinese folklore there are 5 elements, which govern all of existence. Every 2 years, the ruling element changes into the next element. This is constructive because the universe is nurturing, always improving and giving us what we need, even if we think we need something else. Again, in Chinese folklore, fire precedes earth, which means that fire is the creator of earth. he degree we’ve burned (in 2017) and created earth (in 2018) will determine how much raw material we have to create something new, as earth comes from the ashes of fire in the law of the five elements. In 2016, the Fire Monkey taught us that evil is real and something we need to reject. In 2017, the Fire Bird taught us to transform this evil, by purifying it and elevating it into its next higher vibration. Then, in 2018, the Earth Dog asked us to make something from the ashes of the past two fire years and create something we can commit to. The nature of the Hog is to gather and sometimes even hoard things, but only so that we can let them go. When we are too attached to the material world, we enhance our suffering. These attachments need to be released so that we can be in the world, but not of it. So while we are to let go, we need to have something to let go of, otherwise we cheat ourselves of the opportunity to release. In the Yin Earth Hog Year, we are bestowed with the energy to generate more, but only so that we can let everything we create go. Where the ego is threatened by this concept, the essential self is relieved to release attachments to illusion. ﻿Animals are sentient beings. Less intelligent than humans, yet they can experience suffering - this is the nature of the beast. For example, they are in constant fear of predators. As conscious humans on a spiritual path, we can help animals by giving them meaning and purpose. We do this by accepting the archetypes that they radiate to help us on our path, which intrinsically makes the world a better place. In other words, when we attain peace of mind even for a minute, it contributes to the wellness of mankind and the world. It is our responsibility to clean and heal the world by organizing our emotions and mental attitudes. There is nothing we can do in the world that is of greater benefit than handling our own beast within. With this understood, we can use the animal kingdom as signs and messengers that support us on this path, and in return we bless them for helping us. It is a beautiful relationship to have with domestic and wild beasts - to use their symbolic meaning to help us tame our own inner animal nature. 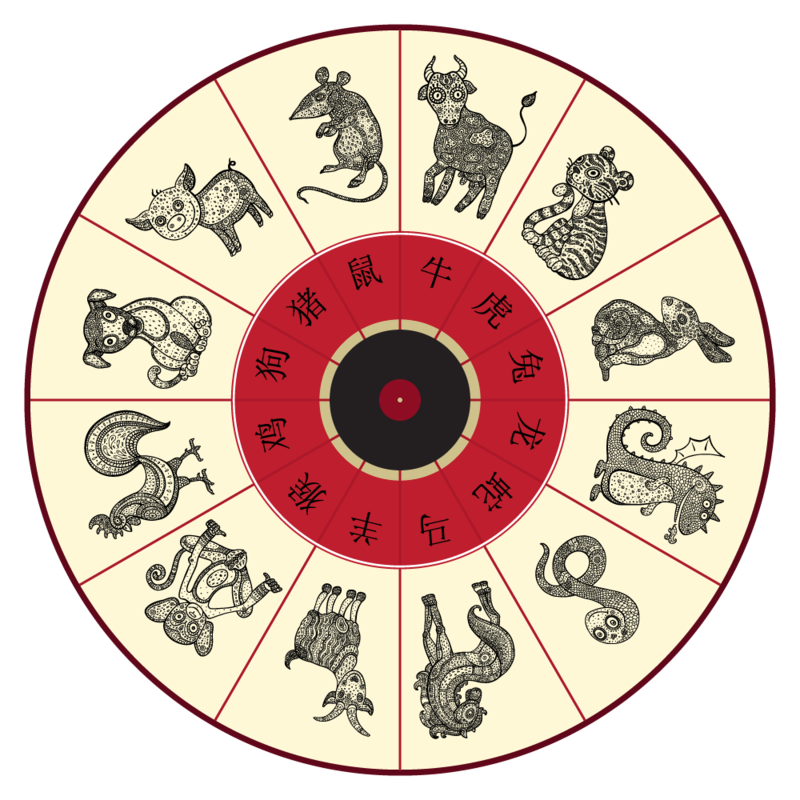 For this, within the animal kingdom are a court of 12 animals who hold the cycles of the year in conjunction with the 5 elements of: wood, fire, earth, metal, and water. Before the Buddha attained enlightenment he wished to bless all of the animals that helped him on his successful journey. But only twelve animals heeded the call and went to visit the Buddha in a very particular order. As a result, the Buddha named each cycle after the order in which the animals came to visit him. While the dog was the eleventh animal, the hog was the twelfth and final animal to appear in front of the Buddha. Auspiciously, the current western year 2019 reduces to 12. Which is in perfect harmony with and enhances the power of 12 for this year - which, in the DASH® tarotypes system is “The Sun”, a quality shared by the Hog. Where the dog was “yang” energy, which is male, the hog is “yin”, which is female. We all have yin and yang within us, which can be likened to a battery or an atom that has both a positive (yang) and negative (yin) charge. We need both yin and yang to create circuitry. With circuitry, we function with an uninterrupted, powerful, and effective flow. Too much of either yin or yang creates imbalance and can short circuit our system, leaving us deenergized and in a state of shock, pain or imbalance. When we are in a yin cycle, our overall energy is ascending towards heaven to help us increase our vibration, with emphasis on the: so below, “as above”. The Earth Hog wants us to learn how to elevate our physical world and give it higher meaning beyond its material value. The Hog. Don’t eat where you poop. It is said that the hog was the last animal to visit the Buddha before he attained enlightenment because he got hungry on the way to heeding the Buddha’s call to thank all the animals who helped him. The hog stopped to eat and then fell asleep, which is how it got the reputation of being lazy. The Buddha only heard an oink and squeal as the hog approached the Bodhi Tree before he became enlightened. Hogs, and all the of swine family, are very similar to humans on a biological level and are often used for human medical research. Thus, eating pork is similar to eating human flesh. The Bible implies that eating pig is forbidden and we learn from other sacred texts that consumption of pig is too powerful for our system because swine radiate at a very high realm of Arich Anpin. When we demystify some of the reputations that come with the pig, we find that they are naturally intelligent, great problem solvers and are easier to train than both dogs and cats. Plus, they are unable to sweat, so they take mud baths to cool down. They are not sloppy and are naturally clean and lean, unless they are fed by farmers for butchering. Left alone, we can see why pigs are somewhat sacred animals, make for popular pets and they even do not poop where they eat, sleep and live! In Germany, pigs are known as a totem for good luck. Marzipan pigs are a popular confectionery, especially during the New Year. In Buddhism the deity Marici, a bodhisattva associated with light and the sun, is often depicted riding in a carriage hauled by several pigs. Pigs use their snout to dig into the earth to find food as it is a very acute sense organ. In a hog year, we may have a sense for success and be able to smell treasures that are hidden from us. Keeping pigs captive is very unfamiliar to them and causes them a great deal of stress. For example, mother pigs can become so stressed in captivity that they will attack their piglets and even eat them in certain cases. It’s almost like the mother pig knows what farmers are doing to them isn’t right and want to protect them and us from going against nature. Because swine are of the higher realm, our humanly bodies do not have the vessel to withstand the energy of eating swine. Yet, billions of people do it everyday. There are around 1 billion pigs alive making the pig one of the largest population of mammals in the world to accommodate this diet. Yet, the risks of eating pig, or anything that we cannot handle, can become great. For example, pigs can eat human flesh when exposed and we have all heard of the saying “you are what you eat”, but we are also the thing the animal ate. You wouldn’t dream of eating human would you? Soylent Green anyone? As there are so many biological similarities between humans and pigs, there can be a risk of diseases such as swine flu and parasites that humans can take on. Likewise, pigs can catch a common human flu too! So the bacteria are interchangeable. The hog is considered a lucky animal, as discussed regarding its connection to Arich Anpin. Pigs are well-natured and honest too. They have a pure and simple heart and can be trusted. This can allow for a cycle of increasing trust in relationships and attracting good people. Hogs have a hard time saying “no”, which can lead to hedonism, codependency, and indulgence. We need to all meditate on our ability to say no in situations where we have a hard time doing so. We should also watch out for con-artists. When the hog senses danger it can become savage. The hog has a strong power and drive for money, it just loves it. It can make for a prosperous year and for a generous cycle, just don’t expect anything in return otherwise you’ll never get your money back if you give with strings attached. Generally, the year of the hog is optimistic and promises prosperity. It can also bring in the energy of abundance and its downside: excess and indulgence. So allow for prosperity, but try to stay centered and humbled with it. Earth is the center. It’s where everything comes together, as it is the melting pot of manifestation. It rules over the intermediate times between seasons, when things are changing. Earth years however, have a stabilizing and crystallizing effect. They are a time when things want to be settled in and set into stone. This is why we need to commit to our commitments. If we can manage this, we can receive the blessings of earth, which are prosperity, abundance, and fertility. Earth years can also bring up existential fears about the future. So we need to balance “what is” with “what we want it to be”. For this, the flavor of earth is sweet, and its time of day is early afternoon - typically a time of rest. While sweetness is the flavor of this year, we need to have an extra eye on our spleen and pancreas and watch the sugar intake. Earth is a very powerful element and we should use it wisely this year. 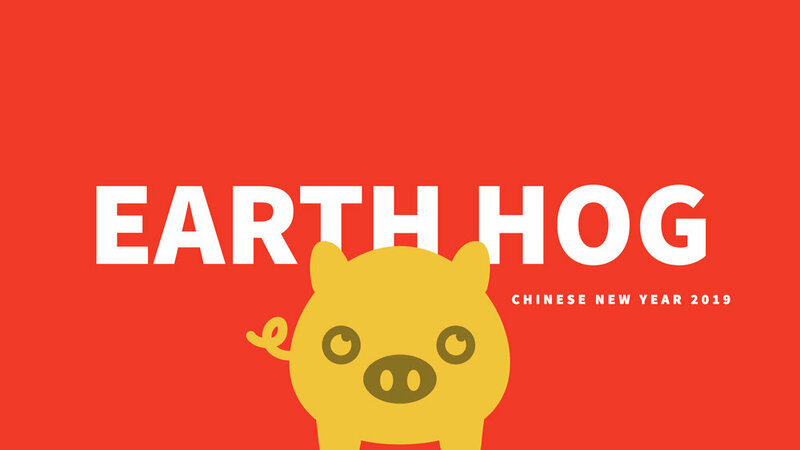 People born in an Earth Hog year are resourceful and have a good, intelligent nature. These years also have an impact on agriculture and the fruit of the land. If it isn’t obvious by now, hog and earth are naturally compatible. The hog loves to roll around in the mud to cool down and can sniff out food within the soil. The hog teaches us how to accept abundance without degrading ourselves with selfishness. “Gyurche” means “Transformer”. In english “transformer” has many connotations and meanings. The word is referenced to a device for reducing or increasing energy that can be used to produce electricity, or transform service into money. The word can also describe a person who changes. The hog year has a strong emphasis on business and money, and we see that commerce is a collective expression of work. The Earth Hog year challenges our attachments to the material, as they can be stronger than usual. When we are too attached to the material we lose sight of the spiritual and need to work harder to sniff it out. 1959: Luna 1 (Mechta) becomes 1st craft to leave Earth's gravity; Fidel Castro becomes the 16th Prime Minister of Cuba after overthrowing Fulgencio Batista; Dalai Lama flees China and is granted political asylum in India; Hawaii becomes the 50th US state; British Motor Corporation introduced the Morris Mini-Minor, designed by Alec Issigonis it was only 10 ft long but seated 4 passengers; Luna 2 launched by USSR; 1st spacecraft to impact on the Moon; Jimi Hendrix (16), rock and roll guitarist, plays his first gig in the Temple De Hirsch synagogue basement, Seattle. He is fired from the band after the 1st set due to "wild" playing; "Some Like It Hot", directed by Billy Wilder and starring Marilyn Monroe, Tony Curtis, and Jack Lemmon, is released in NYC; Mao Zedong resigns as Chairman of the PRC after the disastrous failure of the Great Leap Forward; First Grammy Awards: Perry Como & Ella Fitzgerald win.